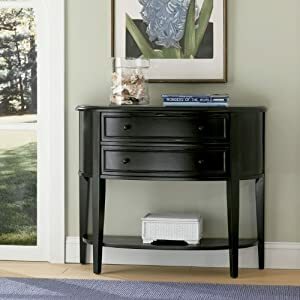 From the entry to the bedroom, the classic bowed front and transitional lines of our "Antique Black" with sand through terra cotta finished console feels warm and welcoming. Two gently curved drawers feature raised moulding and wood knobs. Inset paneled sides echo the drawers’ detail to enhance the finely crafted look. Square tapered legs are perfectly proportioned to lead your eye to the demilune shelf below. Crafted of MDF and solid wood. Leg and shelf assembly.